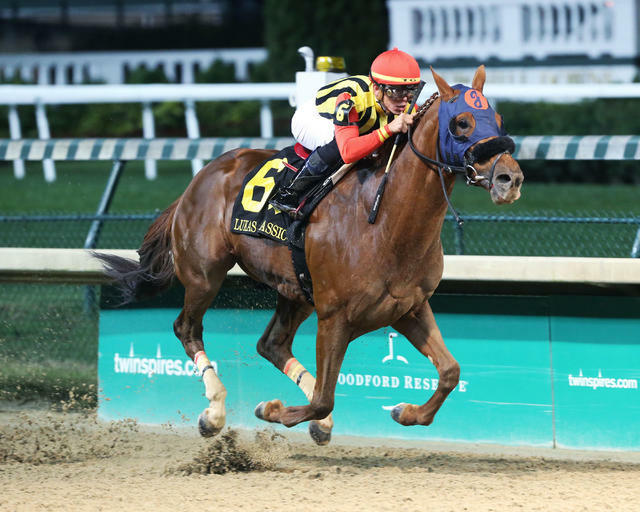 Mind Your Biscuits – the richest New York-bred of all-time – proved he’s a quality horse at most any distance when the three-time Grade I-winning sprinter rolled to a 4 ¾-length victory over Toast of New York and defending champ Honorable Duty in Saturday night’s sixth running of the $200,000 Lukas Classic Presented by Budweiser (Grade III) at Churchill Downs over 1 1/8 miles – the highlight of a stakes quartet on a special “Downs After Dark” nighttime program that attracted a crowd of 16,126. The 5-year-old son of Posse covered the distance in 1:48.64, which was just six-hundredths of a second behind Fort Larned’s 2013 stakes record of 1:48.58. Rising star and Florida-based jockey Tyler Gaffalione rode the winner for trainer Chad Summers, who co-owns the horse with Shadai Farm, J Stables LLC, Head of Plains Partners LLC, M. Scott Summers, Daniel Summers and Michael Kisber. New Jersey-invader Flowers for Lisa set the pace of :23.73 and :48.09 with Mind Your Biscuits racing keenly just behind the leader while between horses with Honorable Duty to his inside and Breaking Lucky on the outside. Midway down the backstretch, Mind Your Biscuits took sole possession of second and then ranged up on the outside of Flowers for Lisa midway around the turn as they ran six furlongs in 1:12.27. Mind Your Biscuits put his head in front at the head of the quarter-mile stretch as Toast of New York rallied wide and Honorable Duty continued on along the rail. The eventual winner spurted well clear down the lane and easily put away his nearest threats for his first triumph around two turns. Prior to the Lukas Classic, Mind Your Biscuits finished second and 2 ¾ lengths behind fellow New York-bred Diversify in the Aug. 4 Whitney (GI) at Saratoga, his first try at the 1 1/8-mile distance. In March, Mind Your Biscuits made international headlines when he scored his second consecutive win in the Dubai Golden Shaheen (GI) on Dubai World Cup night at Meydan Racecourse – his fifth graded stakes win and third against Grade I company. With the victory, he surpassed 2003 Kentucky Derby winner Funny Cide as the richest New York-bred of all-time. Saturday’s victory was worth $120,280 which increased Mind Your Biscuit’s earnings to $4,279,566 (83rd all-time) with a record of 24-8-1-3. Mind Your Biscuits has finished third in the last two renewals of the six-furlong TwinSpires.com Breeders’ Cup Sprint (GI) but is also under consideration for the $6 million Breeders’ Cup Classic (GI) and $1 million Breeders’ Cup Dirt Mile (GI). All three races will be run Nov. 3 at Churchill Downs. Mind Your Biscuits is out of the Toccet mare Jazzmane and was bred in New York by Jumping Jack Racing LLC. Mind Your Biscuits rewarded his backers with payoffs of $4.60, $3 and $2.20 as the 6-5 favorite. Toast of New York, who was ridden by Julien Leparoux off a 245-day layoff, returned $9 and $4.40 with Honorable Duty another head back in third under Corey Lanerie and paid $2.80 to show. Flowers for Lisa, Rated R Superstar, Remembering Rita, Term of Art and Breaking Lucky completed the order of finish. The Lukas Classic honors the iconic 83-year-old Hall of Fame trainer D. Wayne Lukas. The four-time winner of the Kentucky Derby and Kentucky Oaks and conditioner of 26 Eclipse Award-winning champions has been based at Churchill Downs’ Barn 44 since 1989.